The first vintage was the 1951 (The majority of the 1800 bottles were given away to food & wine societies). At first it got a very negative reaction from Penfolds management and the public in general. A typical reaction was: ".. a very good, dry port, which no one in their right mind will buy - let alone drink.". It wasn't until much later, after it started maturing in the bottle, that people started to take notice and Grange Hermitage started on its journey to be the iconic wine that it is today. How much is Penfolds Grange Worth ? The first vintage, 1951, can fetch up to $50,000. 1952 - 1959: Between $2,500 to $20,000. Exceptional later vintages such as the 1971, 1976, 1986, 1990 and the 1998 normally trade between $600 to $1,000. The remainder of the vintages up into the present day typically trade between $300 to $500. A complete collection sells for around $160,000+ although some sets sell for much more when the buyer believes they are investing. See our comprehensive Grange price list and an investment briefing on Penfolds Grange. Penfolds have a history of being bold, aggressively leading the market when pricing Grange. From the outset, the first commercial release of the 1952 vintage was for just under $1, an extraordinary amount in those days. Now, the 1952 can command as much as $20,000 at auction. The 1976 vintage made headlines with the jaw dropping price of $20, the first Australian wine to breach that price barrier. During the 1990's the auction market got way ahead of the retail price, with many people making tidy profits flipping Grange as soon as they purchased it from their local bottle shop. Penfolds responded by putting the retail price up to match the auction value. Rumors persist to the present day about the money making efficacy of Penfolds Grange. In 2013 Penfolds kept making headlines by increasing the retail price to $785 (the auction market sets values on ordinary vintages at $300 and exceptional ones at $500), which creates a lag effect on previous vintages, perhaps dragging those prices up along in its wake or, if the market does not react as they expect, then it will weigh this and future vintages down; time will tell. The 2013 vintage Grange release in October 2017 saw prices on release drop dramatically from the initial asking price of $895 to $730 at most retail stores within a few months which places fair value on the secondary market around $600, less if there is no buying pressure when they start coming to auction in quantity around June 2018. This year, 2018, it will be interesting to see if the 2014 Penfolds Grange vintage can maintain the tradition of increasing the release price again or if they will bow to pressure and hold the price steady. To bid on any auction wines, first sign up as a member (It is free to join) and then when you have been validated you can log in to start bidding when the next auction launches. To be notified when other vintages of different wines will be available for bidding in the future, sign up for our auction alert email. It is illegal to sell wine in Australia without an appropriate licence. Wine auction houses, such as Wickman's, offer regular specialised market places where Penfolds Grange collectors come each month to buy and sell. Wickman's keep in regular contact with known enthusiasts around the world and is an ideal place to start looking for bottles to add or trade from your collection. Signing up for our auction alert is a great way to keep informed when new wine collections and sets become available to trade. What is a hidden Grange ? During the late 50's when production of Grange was ordered to cease, a small core of devotees risked their careers and continued to make Grange in secret, hiding its production away from senior management. Why is Grange famous, what's all the fuss ? It has a interesting history, an unbroken line of production since the very first vintage, consistent quality in each vintage, worldwide acclaim, longevity and limited production. How long should I cellar Grange for ? It is generally accepted that Penfolds Grange does not drink at its best until at least 12 to 15 years after vintage. The best vintages can age for 20 to 50 years. When is Penfolds Grange released ? Up until 2014 it was released 5 years after vintage but from 2015 it is now released 4 years after vintage. It used to be released around April/May but in 2014 Penfolds decided that an October release would suit them better so in 2016 the 2012 Penfolds Grange vintage was released in October 2016. Where to buy the latest release Grange ? You can find bottles of the latest release at fine wine retailers throughout Australia. They usually take 1 or 2 years before they appear in quantity at specialist wine auctions like Wickman's. When is the best time to buy Penfolds Grange ? It is still Penfolds Grange, just an earlier bottle. Penfolds shortened the name from Grange Hermitage to Penfolds Grange with the 1990 vintage. Where to store your Grange ? It is recommended that you store it in a dark, vibration free environment at a constant temperature. The best place would be at a professional, secure wine storage facility like Kennard's Wine Storage, located in most capital cities. How can I find out if an earlier vintage of Grange is any good ? You can ask the members of specialist wine forums like Auswine, post an enquiry to our Facebook page or obtain the Rewards of Patience book from Penfolds. Is there a problem buying Penfolds Grange with an export label ? No, not normally. But as always check the provenance (A specialist wine auction house will have a provenance policy) as wine with an export label may have travelled extensively overseas and back again. Is Penfolds Grange a good investment ? Do your research. Good vintages, exceptional publicity and a supply shortage always do well in the short term, but on average there have not been any vintages in the last decade or so that have enabled a consistent positive return on investment in the short, medium or long term. What should I look out for when buying older bottles of Penfolds Grange ? The most important aspect is being able to prove or discover your bottles purchase history and how it has been stored over time (its provenance). This can be extremely difficult to accomplish unless you are buying it from an auction house such as Wickman’s who document such factors. The next thing to check is the ullage of the bottle and make sure that the level is the correct level for its age or if there are any signs of weeping (Guide on bottle terms and estimating risk at auction). Minor soiled, scratched or torn labels have only a small effect on the bottles value. What are the 'rewards of patience' ? It is a book produced by Penfolds containing the results and tasting notes of one of their iconic, comprehensive tasting panels where they open a bottle of every wine they have ever produced (where practical). What is a cliniced or recorked bottle of Penfolds Grange ? Privately owned, older bottles of Grange are opened & tested during one of the many re-corking clinics that Penfolds hold around the world. If they pass then they are topped up, recorked and labeled as still being drinkable. This can increase the value of the bottle in most circumstances. The 2018 Penfolds Re-corking clinic dates and locations for Australia will be released mid year and have been announced that they will be held in November. How long should I decant Penfolds Grange for ? The younger the wine the more air it may need. How long really depends on the age of the wine and its provenance. If you decant for too long it can die on you before you get a chance to drink it but if you don't give it enough time it can be closed and mute when you come to drink it. If in doubt ask those with practical experience on one of the wine forums such as Auswine. What year is my Penfolds Grange ? There are two years on the front label, the vintage and the bottling year. It is the vintage (the year in which the grapes were picked, usually on the left side of the label) that is used in quality charts and valuations of Penfolds Grange. Is a signed bottle of Grange worth any more money ? Yes, the bottles signed by the late creator of Grange (Max Scubert) may sometimes add 10% to 15% onto the final hammer price. Is Penfolds Grange an investment grade wine ? Certainly. It has an extraordinary history, consistency and acknowledged quality on par if not exceeding the likes of the top tier investment wines from France. On the world stage it is an unrivaled bargain at $300 for average vintages and $500+ for exceptional vintages and $160,000 for a complete set is an unheard of bargain given the quality and history of this wine. Unfortunately it does not have the international demand of its foreign peers and its retail price is bloated by Australian government taxes and marketing demands from the winery itself. Where can I get further information about Penfolds Grange ? Your best bet is to ask people who cellar and drink it on a regular basis. You can find a number of those people, happy to share their knowledge, on specialist wine forums such as the Auswine forum or post an enquiry to our Facebook page and if we don't know we will try to find out for you. 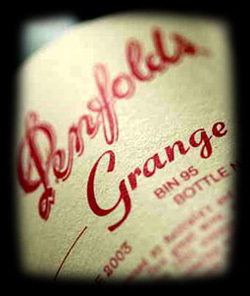 Where can I get royalty free images of Penfolds Grange if I am writing an article ? We have a gallery of various images collected over the years, please help yourself, just remember to attribute the image to Wickman's with an active link. Google+ Copyright ©2018 Mark Wickman, All Rights Reserved.